Chronic appendicitis usually refers to a milder form of the illness. Chronic appendicitis is very rare and its symptoms are less pronounced, in some cases even undetectable. Judging by its gravity and rate of development, appendicitis can be either chronic or acute. Acute appendicitis is very common and it is characterized through intense symptoms and fast rate of progression. Chronic appendicitis has a very low incidence in people and it is characterized through milder, almost unperceivable symptoms and a slow rate of progression. The general symptoms of appendicitis have an unspecific character. While acute appendicitis is considered to be difficult to detect, chronic appendicitis is almost impossible to detect relying only on the patients’ reports of symptoms. For instance, while patients with acute appendicitis experience abdominal pain, high fever and nausea, people with chronic appendicitis may only experience a generalized state of fatigue and illness. The only effective means of diagnosing chronic appendicitis are blood analysis, endoscopy and abdominal computerized tomography. 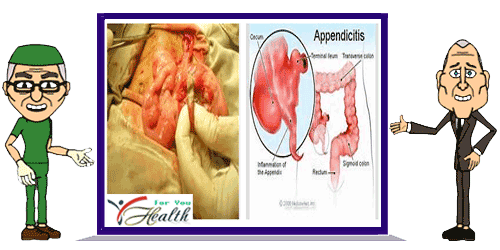 Appendicitis in general refers to obstruction of the vermiform appendix and internal bacterial infection. The appendix is a tubular extension of the large intestine and its function is thought to be related with the process of digestion. When the appendix is blocked by calculus and feces or it is squeezed by the lymph nodes (due to bacterial infection, the lymph nodes usually become swollen and press against the appendix), it swells and usually doesn’t receive enough blood. Bacteria grow inside the appendix, eventually causing its death. Acute appendicitis involves complete obstruction and fast deterioration of the appendix. Chronic appendicitis, however, involves a partial blockage of the appendix and a less serious form of bacterial infection. The symptoms of chronic appendicitis are milder and have a recidivating character. Chronic appendicitis evolves slowly and it may take months until the illness is finally discovered. Although it takes a long time to progress, chronic appendicitis is considered to be a serious form of appendicitis. Due to fact that it can be detected after long periods of time, the bacterial infection may slowly spread to the internal organs. Considering the fact that chronic appendicitis is not manifested through pain, nausea or fever, the infection might progress undetected. Therefore, both acute and chronic appendicitis can lead to serious complications. Patients suspected of having either acute or chronic appendicitis need to go through detailed physical examinations and laboratory tests in order to find out their actual diagnose. If left untreated, both forms of appendicitis are considered to be life-threatening and in many cases special measures are required in revealing the presence of the illness. Considering the fact that chronic appendicitis has no specific symptoms, its presence is very difficult to detect. However, its treatment doesn’t necessarily involve surgery, as in the case of acute appendicitis. If it is discovered in time, chronic appendicitis can be overcome with antibiotics. However, chronic appendicitis has a recidivating character and therefore ongoing treatment is required.